On Tuesday, Eric said the Enchiladas with Cilantro Avocado Cream Sauce would be the best recipe all week. After making this recipe yesterday, I announced it was the best recipe of the week. Eric rolled his eyes. He just doesn’t ‘get’ nut butter! This little gem of a recipe called, ABU, comes from Heather of Heather Eats Almond Butter, which was adapted from Emily’s PBU recipe. Essentially, you blend almond butter (or nut butter of choice) with an equal portion of non-dairy milk and add any sweeteners, spices, or mix-ins you desire. I believe the names ABU & PBU are a play off of the PB2 powdered peanut butter product. By doing this, you are doubling the volume of your nut butter, while preserving a creamy nut butter taste. It is also great for those of us who are sensitive to nuts. Normally, I get stomach pains when eating plain almond butter, but I didn’t have any when eating this ABU so that is a huge plus for me. I saw this recipe on Heather’s blog a couple years ago and I am kicking myself for not making it sooner! I obviously need to get my priorities straight. Directions: In a blender add your almond milk, followed by almond butter, maple syrup, and ground cinnamon. Blend until smooth. Store in the fridge in a sealed container. Makes 1 and 3/4 cups. Nutritional Info: (Makes approx 28 tbsp) Per tbsp: 45 kcals, 4 grams fat, 0.4 grams sugar, 1 gram protein, 2 grams carbs. I added a touch of cinnamon to the original recipe and increased the maple syrup by a couple teaspoons since I don’t use stevia. It was just amazing! My mind is already swirling with other flavour ideas. I will have to try it out with homemade almond butter too. Can you imagine how good this would be with Barney Butter? Or a vanilla bean? I tried it with a tart Granny Smith. by the spoonful like I did! How would you eat this? What mix-ins, spices, or nut butters do you think would be good in it? Eric took the day off work today to begin deck construction! Shayne and Dan are here to help out which is awesome. Zac is coming after work tonight and we have more friends coming this weekend. What would we do without our dear friends? Thankfully, today is a sunny day, so they are going full force all day long! Early this morning I headed out for a chilly half hour walk and did some Whittle My Middle and stretching when I returned. Walking is a great way to ease back into exercise after being sick. I don’t want to overdo it, but I also want to get active so it is a nice compromise. I came back with a clear head and lifted energy to start the day. I love how the food in your pictures just drips all over the place, lol. That would drive me nuts, but looks wonderful for photography! That looks heavenly!! Your pics are always so gorgeous! Your photos are always so appetizing :) I’m going to have to try PBU/ABU! 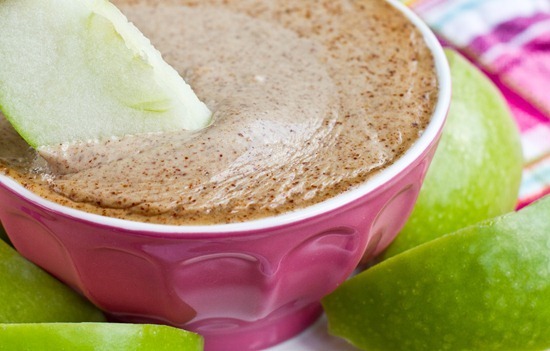 I blend pb into yogurt sometimes and use it as a dip for apples and bananas. I can not wait to try this, thanks for sharing! Oh my goodness, these photos are gorgeous! I love the bright pink and green. I think I definitely need to make this…maybe I’ll use my PB & Co cinnamon raisin swirl! But I would think I could do the same thing with peanut butter or cashew butter…don’t you think? This looks too delicious to pass up! It does! I just tried it with my homemade cashew butter and with my homemade ‘nutella’. Thank you SO much for this. I can’t believe I didn’t think of this idea before. I adore my nut butters but I am always too fearful of the high calories to eat them. So they just sit in my fridge, staring mournfully at me. This way, I feel like I have substance when I eat them. And both versions are DIVINE on apple or frozen banana slices! Thank you! I want to make this ASAP! I always go overboard with putting peanut butter on apples because it is so dense and I end up using way more than 1 serving…but this is great because the consistency isn’t quite as dense! Drippy ooey gooey goodness…nom. I really enjoy PB2 – in fact, now I’m craving it! My heart just skipped a beat. Ow wow. What a great idea! Can’t wait to try!!! 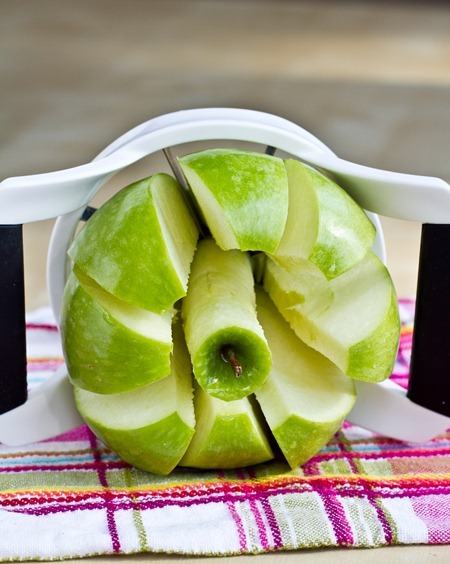 I see you’re using your Apple Slicer. Seriously one of my fave kitchen gadgets. Call me lazy! I can totally see myself eating (a non almond version) this with a spoon. The consistency looks awesome! So drippy and creamy :) I’d definitely eat this with some messy s’mores or on top of pancakes/oatmeal!! Thanks for the milk tip! I am excited–this looks amazing and i eat almond butter pretty much every day. I was just wondering, is there a reason why you don’t use stevia? Hazelnuts + chocolate = heaven. I actually had plans to make something similar to your recipe today but using hazelnuts, almonds and some chocolate swirled in at the end! I am an ABU/PBU virgin ~ I’ve never even heard of it before! I just so happen to have some natural peanut butter in my fridge and I think I’ll be making up my own special blend tonight. I love that you can cut the calories and customize your very own flavour – thanks for the great recipe! Yummmm….I would have to add cocoa and cinnamon. I love chocolate + cinnamon together. If I left it plain, I would try dipping carrots and celery in it. This is sort of a silly omni question, but I’m assuming I can use regular milk and it’ll work just as well? My family refuses to buy non-dairy milk outside of Lent and Advent (the only times of the year when we eat a vegan diet) but I’d LOVE to try this. Sounds genius. Ohh, yum – this looks incredible. I might be able to get my kids to eat sunbutter if I can mix it with other things they love. Baby steps right? This looks amazing Angela! I will definitely be making this ASAP! Can I ask why you don’t use stevia? I’ve never used it myself, but I see lots of people using it. 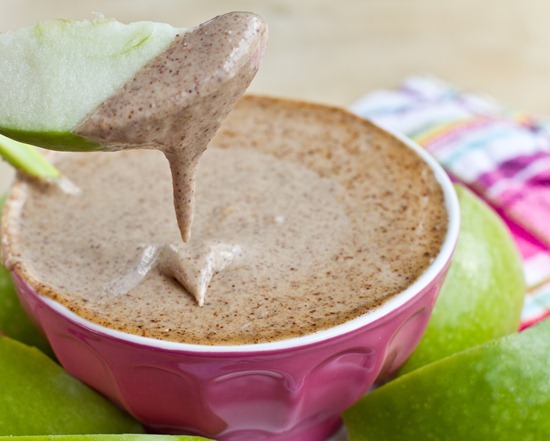 I am not a huge almond butter fan, but these photos have me drooling! This looks absolutely amazing. These pictures seriously have my mouth watering. I am in search of some almond butter today! Thanks for sharing. Looking forward to trying out this recipe. That looks so delicious! I’ll have to check out HEAB’s original recipe! Why haven’t I tried this either?! I want to try it with different nut butters as well, or even a combo of them…YUM! Thanks for sharing and thanks to HEAB as well! I had no idea there was a whole movement! I did this to thin out the Spiced Almond Butter I made the other day in order to toss it with quinoa. Deliciousness! Yes, oooooh YES! I’m drooling. I’ve been buying Better n’ PB because I am nut butter obsessed and can definitely OD on the stuff, but I don’t like it’s “unnaturalness”. This may just be the answer to my craving. Now I can eat twice as much almond butter! ;) Must try immediately!!! 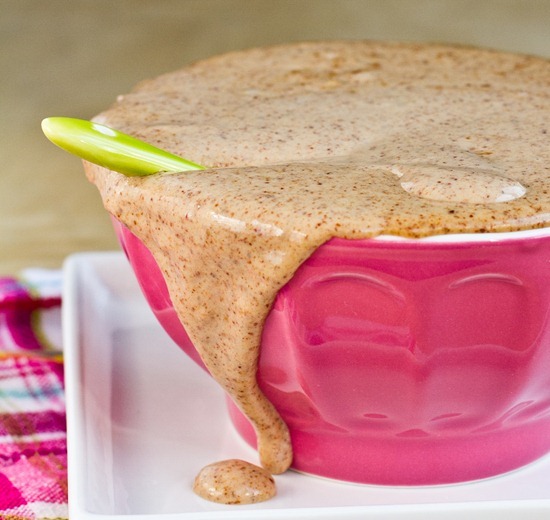 Wow – what a great way to make nut butter better! I could honestly eat half a jar in one sitting.. now I won’t feel so yucky if I do.. bye bye tummy pains! YUM! finally I can eat a whole jar of nut butter ;) i love walks.. they’re so relaxing. probably my favorite form of exercise rather than running. walking = meditation to me! 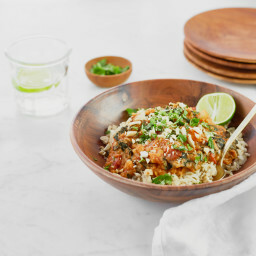 Drool inducing photos, recipe is phenomenal! Genius. I’m doing it, because it looks amazing and almond butter is expensive! Thinking out loud here, but since almond milk is just almonds + water, and almond butter is just ground almonds, couldn’t you just grind almonds and water with the seasonings to make this?? hmm. this may be an experiment for my vitamix!! well, it didn’t take me long. I’m happy to report this does in fact work! I used 1 cup of chopped nuts (a mix of almonds and walnuts) and ~3/4 cup water. It’s easier and less mess than making almond butter OR almond milk. Next time I would use toasted nuts, but it is still amazingly delicious! Love it! I have the last 1/8 of a jar of almond butter left. I didn’t stir the jar well enough so the bottom is on the dry side. This is a perfect way to turn the dregs into something fabulous. Hm, last time I tried PBU/ABU, I wasn’t too impressed, but I think adding maple syrup and cinnamon would make it much better. I think I’ll try it out with jar of Barney Butter I bought! Thanks Angela, I will SOOO be making this. 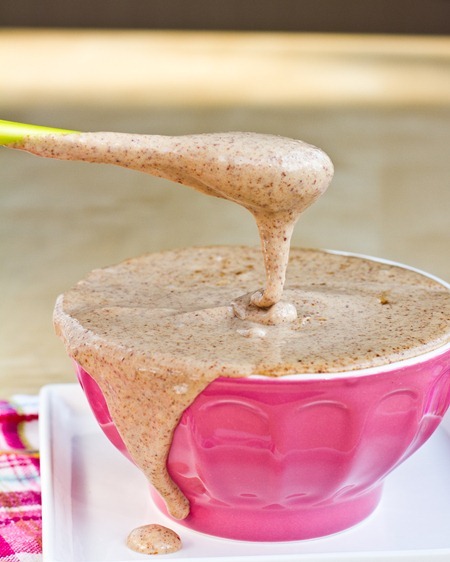 (I have an almond butter addiction – and this will be fantastic!) 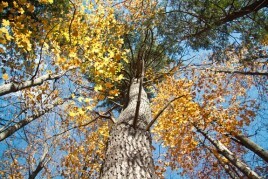 Have a great day, hope the deck construction goes well. That looks so creamy and delicious! Does the flavor get diluted at all? 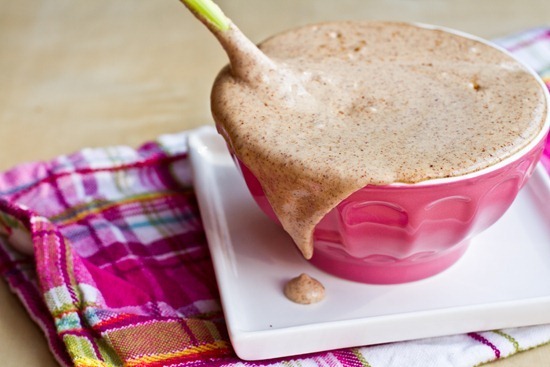 Looks so yummy…especially if you do decide to make your own nut butter then go from there. I like the idea of mixing maple syrup in because I have a delicious one right now! I would probably stick to the basics for the butter itself, then try toping it on new things! Oh my goodness, that looks amazing! I’m going to have to make that ASAP. Thanks for sharing! Genius! I want this NOW! I love how creamy this looks. I think it would be delicious over banana soft serve with some homemade vegan fudge sauce! Alright, all you ladies are MASTER GENUISES! I will be making this for sure. :) Happy Spring day to you! This looks great! I eat so much of it, that it being half in cals really helps! I’ve done this before with bananas instead of milk and I’ve also seen recommendations for doing it with pumpkin (which I would guess is completely fantastic)! this is absolutely brilliant!i am making this ASAP! Woah, yum! My mom is visiting for Mother’s Day this weekend, I am thinking this, drizzled over steel cut oats will be perfect for one of our breakfasts! Omg omg, so excited to try this!!! :| sooo what you’re saying is I can eat DOUBLE the nut butter with the same amount of calories? Brilliant! I have so many clients [myself included] that will love this! The sun was out this morning…but looks like rain now. Looks interesting…nut butter with the milk hey? Do you need a fancy blender for that though?? May I ask why you don’t use stevia?? Holy fantastic and bright photos today!!! LOVE the pink + green!!! I do this a lot, but just a single serving at a time. Love it!!! :) Heck yeah, WMM. I think I’m getting close to 1 month, but I wasn’t really counting the days. I walk a few times a week and really enjoy it, unless the dogs are acting like fools, then it stresses me out, hahahaa. Thank you…could you tell the SUN was out in those pictures! What a difference the sunshine makes. We’ve had a month of rain and I noticed how it was making all my pics look crappy. Anyways thanks for noticing…I had fun doing this shoot yesterday! Oh my lord must make as soon as possible. So simple and so yummy looking! I would drizzle it generously over pancakes. Holy yum! that would be great with some raisins! I have no idea how I would eat it… but it would be with a smile! American Idol literally just screened here in Dubai… so I wanted to pop in and say you were right! Haley is becoming one of my favourites on AI. She was so so so good tonight! She is my fav…and she was a fav of mine since I saw her 1st audition! I have a feeling she could go home tonight b/c the judges were hard on her for her 1st performance. I really hope she doesn’t…I think she gets a hard time from the judges! I truly love her unique voice. I thought they were really harsh on her too! My BF thinks J-Lo is jealous of her because she has such a good voice. I’m not so sure…. I used to find Haley’s personality a bit annoying but she seems so much more confident with herself now. And there is no doubt she is the best singer in the competition. Fingers crossed!! Mmm this looks wonderful!! I’m going to whip up a batch RIGHT NOW! That looks amazing! I’m going to make some asap! Great combination of flavors, and easy to make too! I am all about easy, yummy recipes! oh wow coconut milk would be great! Your ABU pics are gorgeous Angela, and they make me want to go make a batch right now as it’s been way too long. I am loving the idea of adding a vanilla bean. Yeah, that needs to happen soon. So may possibilities. Thanks again for reminding me of this one! yummmmm! perfect for a day of 100 degree weather before the pool! I remember ABU and PBU from the 1st time around. Shows that I have been reading blogs for way too long. haha! I love that you unearthed this recipe and made it. And I think I need an apple corer. That and more lenses, camera equipment, and kitchen gadgets and my world would be complete. Never heard of this before… need to try with PB sometime. OMG! When I saw the picture of the nut butter oozing down the side of the bowl I was speechless and just staring wide eyed at the screen trying not to drool on my keyboard. Have to make this asap! My son and I make healthy “banana splits” Like your banana split voo but with the voo, we love that all on its own. I was trying to drizzle almond butter on them but it was too glumpy this is perfect. We take frozen strawberries, microwave till syrupy, slivered banana pieces, drizzled with almond butter, sprinkled with coconut, chia seeds, then dusted with carob powder and topped with a few chopped nuts. I love this as a dessert. Topped with ABU it will be perfect! Oh my gosh, I have GOT TO TRY THIS!!! I would put this (unsweeted) on a multigrain toast with fig jam. I love LOVE warm toast with almond butter and fig jam…with a cup of cardamom infused persian tea. omg. WOW this sounds amazing! I love flavored nut butters and this is such a great way to do it! Is the consistency still thick like regular nut butter? Or is it more drippy? Just curious! this is such a great Idea! I always think that almond butter is too thick and too expensive. both problems solved! Ok, you have me intrigued! You’re pictures are so tantalizing!! This looks insanely good. I want to slather it on bread, apples, bananas, oats! That’s amazing! I’m bookmarking this for sure. Wow I’m gonna have to give that a try, it sounds so tasty and yummy. This stuff looks amazing! How long do you think it will last in the fridge though? Hmm, I still vote for Enchiladas . Maybe I, like Eric, just don’t get nut butters? 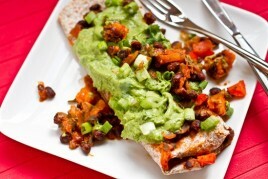 Recipe of the week indeed :D I can see this going with oats and yoghurt just perfectly. First of all, I want to say thank you. You have been an inspiration and I truly enjoy your honesty and recipes. Ultimate Walnut Lentil Loaf is on deck for this weekend. As for this recipe, it reminded me of this Pumpkin Dip I loved but can no longer eat because of a milk allergy. Do you have any ideas on how to make something similar? Blend together ingredients and chill. Cut up apples, pears, bananas, etc. Serve with fruit for dipping. Hi Anne, Thanks for your kind words! Im so doing this with my sunflower seed butter right now I cannot stop eating it! I’m with ya girl, I am ADDICTED to sunflower seed butter! LOVE LOVE LOVE IT! I’ve got to try this. Save those drips! Be still, my heart! I had the dumbest revelation ever. I HAVE A BLENDER! All the stirring used to put me off of PBU. But no longer! Yummm…considering I love to drizzle everything in tahini…good times are ah-coming. I wanted to literally cry when I saw this! I can’t eat much in the way of fat and I’ve been trying to get in some healthy fats, but often end up having too much pain to make it worthwhile, so this is genius! 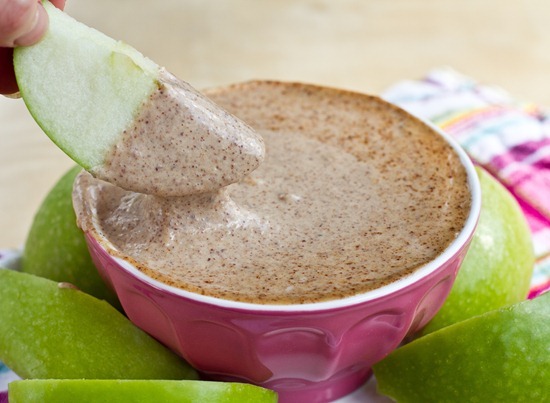 I’ve been craving almond butter soooo long now, this just might be breakfast tomorrow! I’m not sure if you realize how much impact your blog along with many others, has had in my life. 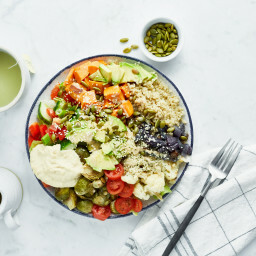 Going through a major health crisis 3 years ago, I was left with little information on how to nourish myself until I discovered this little community of food bloggers who have helped to sustain me and give me more to eat than just apple sauce and oatmeal, so thanks for being part of that! Dude! 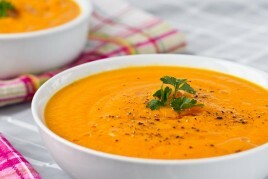 I make something really similar to this for apples, carrots and celery.. I just call it “dip” (which kind of sounds like I’m a character in Who Framed Roger Rabbit), but if you mix 1T nut or seed butter with 1c of plain greek yogurt it is bomb. Not as drippy looking as this one, much thicker, but super delish! Yum. I would be so tempted to just take a spoon to that bowl and eat it straight. I’m trying this with coconut butter in the morning. Oh yes. I am. I am so happy! You made my day! I woke up this morning and said no more peanut butter, I am consuming way to much! Between granola and PB, I have been consuming 75 grams of fat a day! Not good!!!! But now! He he I can have ABU on everything, well in moderation of course! Thank you so much for sharing, I am going to make this, this afternoon!!! This looks soo good! Thanks for sharing and giving me something to look forward to make for the weekend. I would even try this with Dark Chocolate PB, or my sunflower seed butter. I’m thinking sunflower seed butter, which is my absolute obsession. YUM. It sounds delicious, but I think the problem for me is that it’s way too runny that way. I enjoy my nut butters on the side of things because I enjoy tasting them by themselves. And I keep them in the fridge so that they stay hard and thick, melting them on my tongue. But super neat idea, maybe would be good in some sort of recipe that calls for a nut butter that I could make lighter. I did this IMMEDIATELY after reading this post with my peanut butter this morning. Awesome! I did cayenne, cinnamon and a touch of vanilla. Yum, yum! Thanks for sharing! I recently tried your dark chocolate almond butter and the whole batch was gone within days! Oops! :) This also looks ahhhmazing! However I may have to wait a little before attempting it myself… my taste buds are still pretty non existent after being ill and I would hate to miss out on the full taste/effect! Thanks for sharing! That looks so good!!! I would eat it for sure, and I think it would be good with some cocoa mixed in! 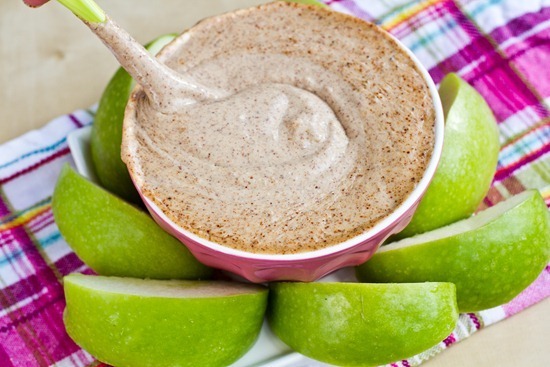 I just made this and drizzled it over apple slices…heaven! I can see this being my go-to topping for banana soft serve, oatmeal, pancakes, waffles, any fruit I can get my hands on, and…oh man, I’m in love. OMG- I LOVE this idea!! And I totally have TONS of TJ’s almond butter to use (which is so incredible; it’s roasted sea salt flava’!!) and can’t wait to make this tomorrow! Hopefully my mama likes it as part of her huge mothers day brunch! I always have it on pancakes – perfect drizzling consistency! Half the calories! That’s what I’m talking about….thanks for sharing this delightful recipe…almond butter is something I muuuuust make soon! Genius! I’m definately making this soon. 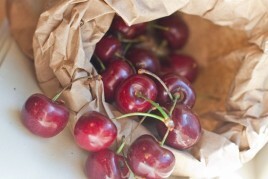 Excellent way for me to get more fruit into my diet- covered in this deliciousness! i cannot wait to try this! i’ve removed all processed foods from my diet and the post baby weight is just melting off. i do miss the yummy indulgences, but something tells me this will help with my sweet and savory tooth… thank you! Just made “Banana Almond Butter Sandwiches” with this….. OMG!!!! Hi there! I’ve been reading your blog for a while, “lurking,” I guess!! I’ve made about half a dozen recipes..all delicious! However I just made this and gave a spoonful to my 6 year old daughter and she sang the song “If your happy and you know it” while liking her spoon CLEAN! She then asked for some in a bowl, like ice cream! Thanks a bunch for this one!!! Thats awesome Sonia! Thanks for sharing! I’ve been making this lately (my new favorite is salted sunflower butter with almond milk) and adding chia seeds to the mix. It gets a little gel-y, in a good way! I’ve been reading your blog for a while now and I think its great! Also love that you are from Ontario (me too!!!) I love that you have a featured recipe of the week! I tried this today! And I dipped my sliced apple in it for dessert! Thanks for sharing all your yummy recipes! I bookmarked this eons ago and just got around to making it. It tastes as just good as it looks, thanks! Amazing. I just made this and I had to put it in the downstairs fridge to avoid eating the whole bowl! I just put some in my popsicle mold and topped it with puréed strawberries… Pb&j popsicles! My girls will be so excited. I have changed my entire way of eating over the past six weeks and it feels great. I am eating primarily vegetarian/ vegan after a lifetime of poor eating habits. Your recipes and photos are amazing and have been so helpful on my new journey. 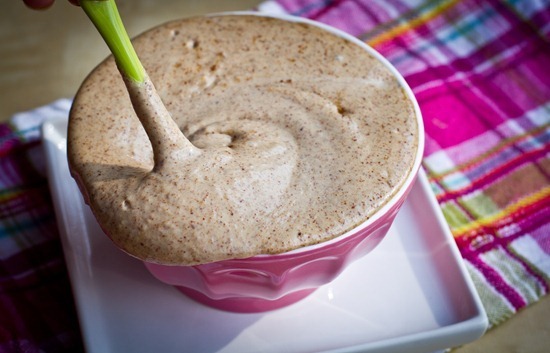 I have recently started using PB2 in my shakes, but this maple cinnamon ABU looks wonderful. Keep the great recipes coming! Congrats Peggy! So happy to hear about the changes you’re making. I’m glad you enjoy the blog too. OMG!! Im not a vegan or even a vegetarian but have just made ur amlond butter and wow ur right i want to eat it all!!! Amazing. Now just got to decide what to put it onto first!!! Also made ur overnight oats pie also very good. Keep coming back to ur site im sure now ive tried a couple of recipes i will keep coming back for more! Yum!! This thing is a lifesaver! I have used this trick many times and it works so well!!! :) I love how it makes it so much lower in calories so u can eat TONS! YUmmmm!! :D Thank uuuu! Oh my! thank god I am not the ONLY one that does this – however, as I am now trying to shift weight and still can’t control myself!!! I can’t digest peanut butter, so I searched for a pure, raw almond butter, but was not successful. I then learned about transforming my own raw almonds into butter. I also added stevia and cinnamon and was very thick. I then tried your method and love it soo much. Now my new nightly snack!! Would I use the same ratio of nut butter and milk for peanut butter, as well? I wanted to love this, because almond butter is expensive and it would allow me to eat more of a food that I love, but it just tastes so watered down and bland, even with the maple and cinnamon. I also tried it with peanut butter and added chocolate to it, but still couldn’t enjoy it. I’m going to stick with regular nut butters in moderation. Thank you for the recipe, though! How did you know how many calories it contained? How long does it last in the fridge? SO! This is an absolutely incredible recipe and I love it! However, after about a week and a half, my double butter began to bubble and ferment, and now it’s…gross. Ha. So, I suppose it doesn’t last that long in large quantities unfortunately. Nonetheless, it is delicious! Such a brilliant idea, I can imagine how amazing it must taste! How long does it keep in the fridge though? Love it! Just made a variation of this. 1 cup Adams Natural Creamy pb, 1 cup Almond Breeze unsweetened almond milk, 1 tbsp orange blossom honey – blend in my power ninja on level 3. Delicious!